Wolfgang Amadeus Mozart will perhaps never be fully understood, nor will our modern scholarship – that now delves deep into the psyche of composers trying to explain the ‘why’ instead of the ‘how’ – explain more or less than is present in the music itself. Luckily, we have an embarrassment of riches when it comes to Mozart. Examination of any of Mozart’s manuscripts will always show more than the sum of its parts, and multiple performances always prove that there is yet another layer to be discovered. In Mozart’s music, musicians find themselves as archaeologists at a dig site, small brush in hand, ever so gently revealing bone fragments, lest they break. This article seeks to reveal some interesting background information, providing a fresh look at these works and the era and atmosphere in which they were written. On 28th November, Maestra Coomi Wadia and the Paranjoti Academy Chorus will perform two glorious works in the grand oratorio style. By chance, the programme provides for a closer look at early and late influences, the ‘Coronation’ Mass dating from 1779 when Mozart was 23, and his ‘Requiem’ Mass incomplete at his death in 1791. Imagine for a moment that you’re 23 years old. Discount that you are way beyond your years as a musical prodigy and already have written in an accomplished manner since you were seven. Because you were paraded around Europe by your father, almost like a circus animal, imagine the strained relationship that you have with him, one in which he insists on controlling not just your music, but your life. What would your resentments and unresolved issues be? Between 1763 and 1773, Mozart was on tour with his father almost continuously, using Salzburg as their base. In 1773, he, very reluctantly, joined the court of the Prince Archbishop of Salzburg, finding that the new Archbishop Colloredo, though a musician, was heavily into church reform, which meant shortening the ‘mass’, shortening the music and shortening everyone’s stipend. This wouldn’t have meant that much, but everyone was used to the court extravagances under Colloredo’s predecessor, Archbishop Sigismund of Schrattenbach, who saw church finances as they should be and not as they were. Mozart was miserable and left the court. In 1777, Mozart and his mother set off on a trip to Bavaria and then Paris. They arrived in Paris, on 23rd March, 1778, and his mother, perhaps the foil to a controlling father, perhaps the true and genuinely loving parent, fell ill in June and died on 3rd July. For most musicologists, the wonderful works for flute, the ‘Paris’ Symphony No. 31 and his Concerto for Flute and Harp might be quite sufficient, but for Mozart, 1778 was an annus horribilis. Returning from Paris, distraught and uncentred, he succumbed to the pressures – put bluntly into the foreground by his father – to rejoin the court of Archbishop Colloredo after having left it on brusque terms. What was a 22-year-old to do? He was forced to accept his former job but now under some humiliating pall. He was required to “unbegrudgingly and with great diligence discharge his duties both in the cathedral and at court and in the chapel house, and as occasion presents, to provide the court and church with new compositions of his own creation”. By 1803 Napoleon Bonaparte was advancing on Europe. Archbishop Colloredo fled to Vienna and the princely archbishopric of Salzburg was secularised and dissolved. He remained titular Archbishop of Salzburg, in quasi exile until his death in 1812. Mozart’s compositional style is so successful, precisely because at the root of all his music is the singing voice. One cannot understand his symphonic, chamber or concerto repertoire, without the backdrop of his operas. His ability to weave a line for a soprano or a woodwind soloist as in the clarinet concerto or any of the great symphonic middle movements for the violin, lands with unerring fidelity because it is conceived as a living, breathing organism. This is the real joy of Mozart and the real mark of his genius. 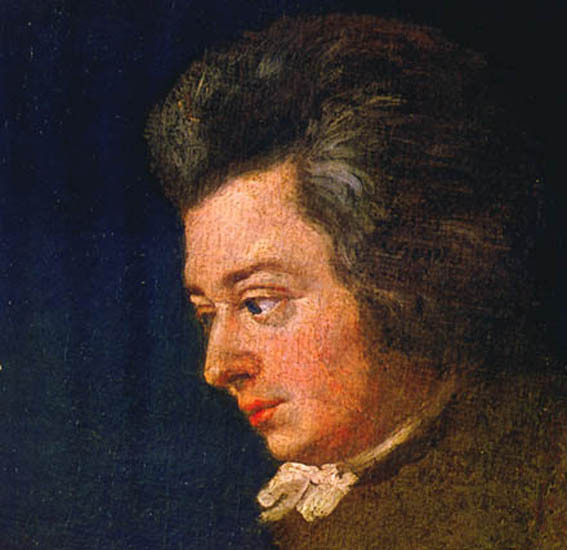 In 1791, by the time Mozart turned to writing the ‘Requiem’ Mass, he was severely ill – in fact, on his deathbed. The work came as a commission, with all the macabre drama of Peter Schaffer’s play, Amadeus, but it wasn’t Antonio Salieri who was to benefit from passing the work off as his own. It was Franz von Walsegg-Stuppach, who was an amateur musician and wanted to be included among the ‘big timers’. His wife’s death in February of that year gave seed to the fraudulent plan that he would commission Mozart to write a ‘Requiem’, and then pass it off as his own. They dealt in secrecy and though money was being paid, the secrecy and dark dealings by which it was paid – through third parties, drove an already weak and highly superstitious Mozart to distraction. Mozart didn’t finish the piece, dying on 5th December, with parts of the work un-finalised. I use the word ‘un-finalised’, because the completions undertaken by Franz Sussmayr, a former pupil of Mozart, bear not only an authentic stamp but it is possible that Mozart played through his ideas for Sussmayr, giving a process by which to complete it. Even so, it is not clear that Mozart intended that Sussmayr should be involved at all. In fact, it was Mozart’s wife Konstanze, who fearing that monies already paid for the piece would be forfeited if it was incomplete, rushed about trying to find suitable people to finish it. Thank god, it was the work of Sussmayr and not someone less familiar with Mozart’s style and the ‘Requiem’ itself. In the baroque and classical eras, re-quoting lines or melodies from other composers was considered homage and not plagiarism. When Vivaldi copied wholesale the concertos of Bach, it was as one master ‘doffing the hat’ to another. We all know that Mozart was a great student of Bach and Handel, as were all the classical composers. Anyone learning with any teacher of the day, or taken on as a pupil by Haydn, Mozart or Beethoven, would have to learn fugal counterpoint and the style of the great Baroque masters. Though no one would ever be as proficient as Bach with fugal form, it was something they all had to master. Mozart’s fascination with Handel’s ‘Messiah’ is well-known. We have a wonderful version of the score edited and transcribed for performance by Mozart. We note the exact melodic copy between the ‘Requiem’s Kyrie and ‘Messiah’s “and with his stripes, we are healed” – or the double-dotted declamation of the ‘Requiem’s ‘Rex Tremendae’ mirroring similar rhythmic patterns in Messiah’s “surely, He hath borne our griefs”. For modern copyright lawyers, it would be cause for complaint. For Mozart it was just reverence and homage to Handel, in which all contemporary listeners would have rejoiced. On 28th November, Mumbai audiences will have a chance to hear live performances of both these works, conducted by the doyenne of choral music in India. Coomi Wadia celebrates an extraordinary 50 years on the podium and deserves grand kudos for that milestone, not easily achieved by any artiste. However, there is a much more onerous achievement that deserves “blessing and honour, glory and power” because of where this milestone was achieved; under what circumstances; against what odds; and with what glorious enrichment of all her protégés over these decades. As a fellow conductor/musician in Mumbai, I know first-hand what these awesome challenges are, and what it takes to ‘face them down’ with courage and fortitude. To do it for 50 years is an unfathomable achievement and deserves the highest respect. The musical mission in India – as much as audiences love it and as much as amateur musicians present it, is a labour of love. No one involved, whether, Jeanni Dinshaw at the Bombay Chamber Orchestra, Wadia at the Paranjoti Choir or any other amateur group – is doing it for anything but the love and joy of music. There are inordinately long hours, administrative difficulties, uncontrollable forces unique to the Indian experience and sporadic attendance at rehearsals. Any one of these would sink a Western organisation managing the same undertaking. Coomi Wadia, along with Paranjoti Academy Chorus and the SOI Chamber Orchestra, will take the stage on 28th November at the Tata Theatre. Zane Dalal is Associate Music Director of the Symphony Orchestra of India and is a frequent contributor to ON Stage. He blogs at www.zanedalal.com/blog. This piece was originally published by the National Centre for the Performing Arts, Mumbai, in the November 2017 issue of ON Stage – their monthly arts magazine.